Havering-atte-Bower is a beautiful conservation village on the outer edge of the London Borough of Havering, located 15 miles northeast of Charing Cross and close to the Greater London boundary. It is situated 344 feet above sea level with striking views of east London, Essex and Kent. The village has been the location of a number of palaces and large houses including Bower House, The Round House, Pyrgo Palace and Havering Palace. The village is surrounded by three large parks; the dense woodlands of Havering Country Park (site of one of only two redwood plantations in England, imported from California); Bedfords Park; and Pyrgo Park. 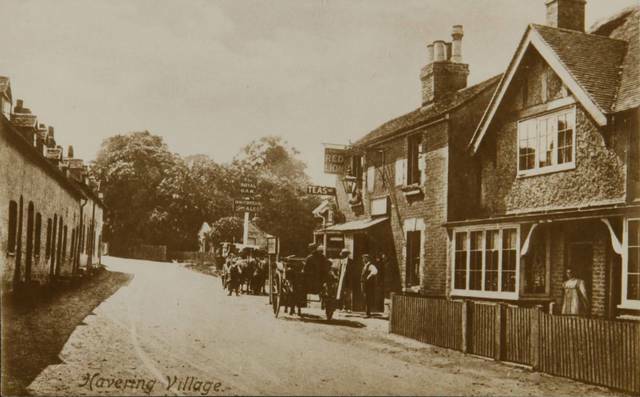 With so much park-land it is not surprising that Havering village had a small population. In 1523 there were only 22 taxpayers, in 1670 there were only 38 houses. 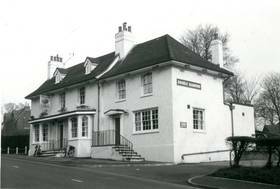 By 1801 Havering had 188 inhabitants, occupying 36 houses. The population climbed steadily to 427 in 1841, but for the next 80 years remained near that level. In 1931 there were 591 inhabitants. Due to the Green Belt Policy there has been little building in the parish since 1931 except for in North Road and in the extreme South West in the triangle bounded by St John's Road, Clockhouse Lane, and Kingshill Avenue. The name is recorded in the Domesday Book of 1086 as Haueringas. It is an ancient folk name meaning settlement of the followers of a man called Hæfer. The name is recorded as Hauering atte Bower in 1272. 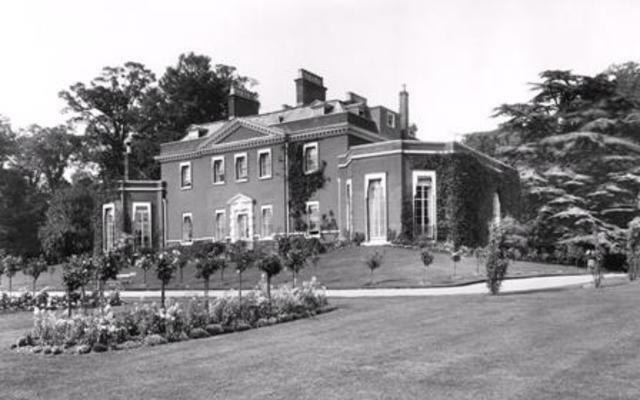 The atte Bower suffix means at the royal residence and refers to Havering Palace, which was situated here. The West London equivalent to Havering-atte-Bower is Old Windsor in Berkshire, which had a Saxon Palace that predated Windsor Castle. Edward the Confessor would have travelled to and from his palaces at both Havering-atte-Bower and Old Windsor. Both villages are situated on high ground and have great views into London. The history of the area dates back to Saxon times and archaeological finds in and around Havering Country Park suggest a Roman Villa or similar structure in the area. Excavations in 1972 and 1975 revealed remains of Roman agricultural and industrial activity over a wide area in fields about half a mile west of the village. The finds were mainly pottery, but also included a complex of gullies, ditches and metal work. A group of cremation burials was found, and there was clearly a Roman settlement at Havering. The village is steeped in royal history. Edward the Confessor was the first royal to take interest in the area as he established a hunting lodge here which over the years would become a palace or 'bower' and it is believed, though disputed, that he may have died in the house that he had loved so much before being buried at Westminster Abbey. Another palace was purchased by Henry VIII, east of the village called Pyrgo to relieve the now ageing Havering Palace. Into the 17th century the Royal Palace of Havering was in decline and was eventually pulled down. Pyrgo was also demolished later, in the 18th century. Only one set of plans exists from the original Havering Palace, courtesy of a survey by Lord Burghley in 1578. James I was a frequent visitor to Havering Park between 1605 and 1624, but after the death of Charles I the land was divided and sold in 1650. The Liberty of Havering was confirmed by Kind Edward IV in 1465 and by his Charter residents had their own Court to administrate both civil and criminal matters, and the Courts even passed the death sentence. Other privileges included permission to hold a three day fair each year. The Liberty was also exempt from Royal Purveyors who commonly took goods for the King at their own price. These privileges were renewed and extended by succeeding monarchs. In 1588 Queen Elizabeth I made Liberty a Corporation and gave it her seal. Traders were granted 'doquets' which exempted them from paying tolls in England. The Liberty fell out of favour in the reign of James II (1685-1688) with the destruction of the royal palaces. In 1833 the commission considered absolution of the Liberty, which was strongly resisted by the officers and continued for another fifty years. The Liberty officers had some interesting roles. The 'Ale Connor' or taster would enter an Inn, draw a flagon of ale, pour some of it on a wooden bench and sit in the puddle for 30 minutes. If the ale was impure and contained sugar the taster would be stuck to the bench. The Liberty finally ceased to exist on 1 July 1891 (when Joseph Pemberton would have been around 39). The last two sentences passed by the Court were 10 months hard labour for a man who stole three rabbits and 10 years hard labour for a man who stole two bullocks. Sadly, no medieval buildings remain in Havering. 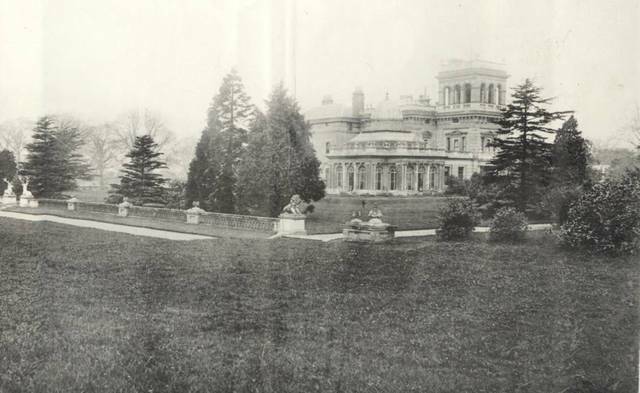 The manor-houses on all six sites, had been demolished or rebuilt by the 19th century, including Havering House, which fell down around 1700. Upper Bedfords was rebuilt around 1771, the medieval vicarage was rebuilt in 1786, and the church in 1878. The oldest surviving building in the parish is Blue Boar Hall, Orange Tree Hill, a timber-framed house of the early 17th century, with later additions including a 19th-century brick front. It was an inn in 1712, but was no longer licensed in 1762. It is rumoured that the Inn got its name after an archer shot a blue boar at the site. Queen Elizabeth I was staying at the Palace at the time and sent for the archer to ask if it were true. The archer claimed that the boar turned blue with fear at the sight of his arrow.... “Blue I saw him as plain as I see the cup of good Essex ale your Grace hath ordered your steward to give me at my outgoing”. Amused by his humour, the Queen frequently invited him to the Palace. 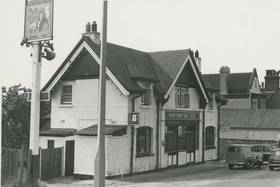 In 1762 there were two inns in the parish, the Royal Oak and the Orange Tree. The Orange Tree, which gave its name to Orange Tree Hill, continues in a modern building. 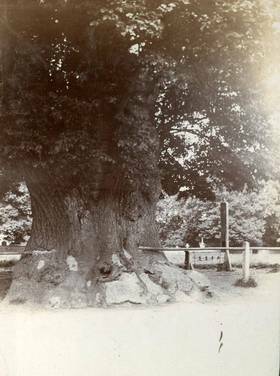 The Royal Oak, recorded from 1744, gave up its licence in 1792. A later house of that name, in North Road, has been trading since around 1920. The Village Green has been on the present site for centuries. The stocks and whipping post stand in the South-East corner. 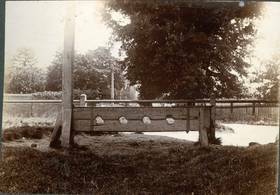 The original stocks are recorded as having decayed around 1670 and were replaced, which incensed the local people who destroyed the replacement as they were placed too close to the narrow part of the road. They were renewed and replaced several more times with the present ones being erected in the summer of 1966. The original green was much larger and sections have been reduced on all sides except the West. Under the commons Enclosure Act of 1811 Havering Green was to remain an ornament for the village forever and not to be enclosed with pale, rail, fence or wall or to be dug up or converted into tillage or excavated for gravel. The Ducking Pond where witches and scolds were plunged into the pond, is now separated from the Green by the road and is partially obscured by a bus shelter which once had a church pew for a seat. 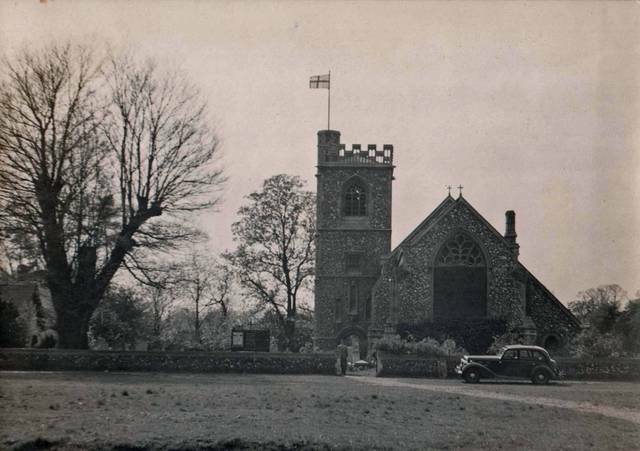 The Parish Church of St John the Evangelist dated from 1874 but records show that a church has stood on the site for centuries. The present church is an early work of Basil Champneys, built mainly of brick with flint facings. The tower has an open East-West passage, a turret and open battlements. A new peal of bells was added in 1897 and a new organ in 1902. The church suffered damaged by air raids in 1940, and the East window was destroyed. The oldest part of the church now preserved is the Norman bowl of the font, which is of octagonal tapering Purbeck marble. The medieval Vicarage was rebuilt by John Heaton (owner of Bedfords from 1771-1818) in 1786, although it is now in private ownership and no longer used as a vicarage. The pump on the front of the house originally came from the church hall. 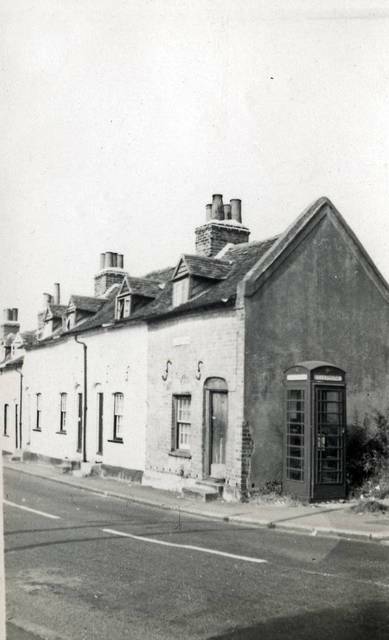 The Hall, Broxhill Road, was owned by Richard Chauncy around 1730.This L shaped building faced the village green, and the old cellar still remains. The cork tree in the grounds is estimated to be around 400 years old, and dates back to a time when there was a great deal of trade with Spain and Portugal. Richard died in 1736 and he is commemorated in stone within St John's although this is a little hidden by the organ-chamber. He left the property to his son-in-law Thomas Hennand, which he later passed to his son Richard Hennand. 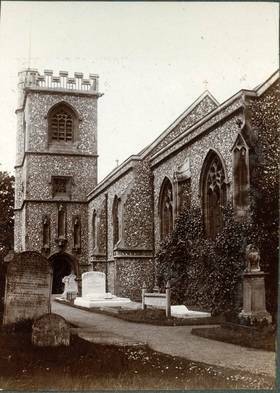 The next occupant was possibly Ambrose Wilson whose tomb stands in the South East part of the St John's church yard. He was a haberdasher of Fenchurch Street, and he had two sons Ambrose and Richard who both died before 1777 unmarried and without children. The Hall was next owned by George Mason, who was the Deputy Steward of the Liberty 1773-1789 and a very active magistrate. In 1795 the property was advertised to let and listed as in good repair, with three parlours, five chambers, five upper rooms with closets, kitchens, pantries, cellars, brew house, laundry, two coach houses, stables for three horses, kitchen garden, two staircases, a diary and fine water. By 1811 this Hall was owned by William Lloyd, but occupied by William Morris who became owner in 1814. He died in 1815 without leaving a will. The property came into the hands of Rev Thomas Leigh and was lastly occupied in 1821 by J P Luscombe after which it fell into decay. When the School was rebuilt in 1837 one of the rooms was used as a school room. It was left full of furniture and villagers were told they could help themselves provided they return any item if ask for. The old Hall was then purchased by Mr Field of Pyrgo who sold it to William Pemberton-Barnes, who had the new Hall built around 1858. Saint Francis Hospice purchased the Hall in 1978. 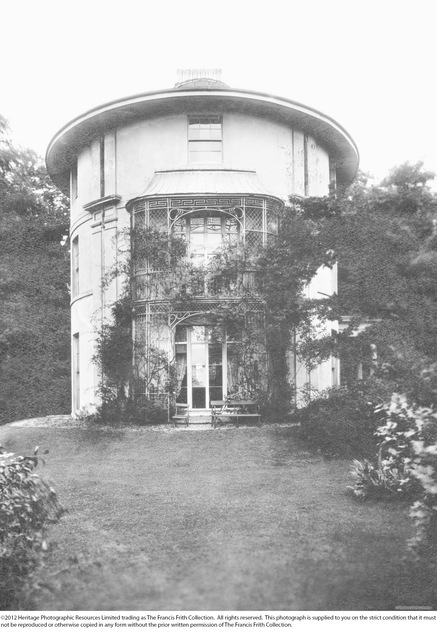 The Round House, Broxhill Road, was erected by William Sheldon and purchased in 1807 by William Jacobs who died in 1815 and left the house to his wife's niece, Mary, who was married to William Whitehurst. 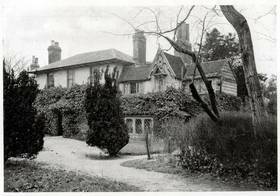 There is a story that the house was built by a retired tea-merchant who had the house designed in the shape of a tea-caddy to commemorate how he had made his money. It is an elegant and unusual three-storey house which stands on the crest of the ridge, with views north and south. It is visible from the road only when the trees are bare of leaves. It is described in Pevsner's 'Essex' as an oval building, three stories, plastered with eight windows on each storey, having four pairs of giant Tuscan pilasters, a porch of two pillars and two Ionic columns. It was occupied at the beginning of the 20th century by Rev Joseph Pemberton and is now in private ownership. 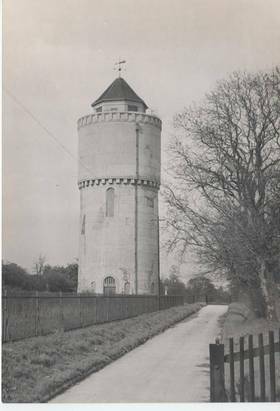 The Water Tower, Broxhill Road, is a prominent landmark that was built by the South Essex Waterworks Company in1934 to look like a Norman tower. The Bower House, Orange Tree Hill, is a small Palladian mansion built in 1729 by John Baynes from plans by Henry Flitcroft. The rooms were not overly large, but elegant, and the house had extensive grounds. The staircase was once decorated with paintings by Sir James Thornhill. An inscription in the entrance hall states that remains of the royal house were used in the building, and a stone corbel with the arms of Edward III is preserved in the hall. It is believed that Charles Bridgeman, the designer, laid out the grounds. Around 1800, the east and west wings were added and in the mid 19th century the main room in the east wing was fitted with paneling in 17th-century style, with an original fireplace, dated 1659. 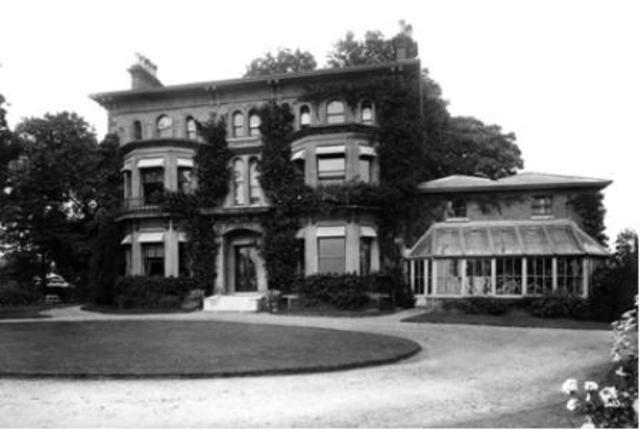 The Bower House was originally built for Mr Serjeant Baynes who was a distinguished lawyer. Following his death in 1729, the house passed to his wife and then to his daughter Lucy. The house was subsequently inhabited by Richard Neave, the eldest son of James Neave of Walthamstow, prior to him purchasing Dagnams in 1772 where he erected a new Georgian mansion, which stood until 1950. By 1774 the house was owned by Hannah Sax, Robert Sax and Mary Sax, followed in 1780 by Sir John Smith Burgess and Edward Robinson in 1819. It became part of the estate of John Barnes around 1833, when he moved to the Roundhouse, although he never lived at the house. 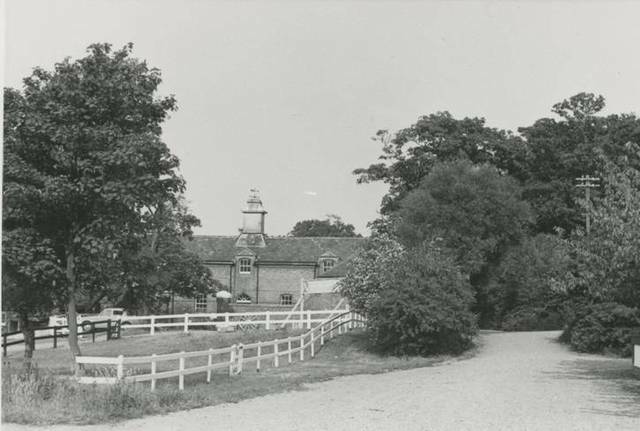 Bower House remained a private home until 1976 when it was taken over by the Ford Motor Company as a training centre. It is now a residential training centre operated by the Amana Trust a Christian charity. 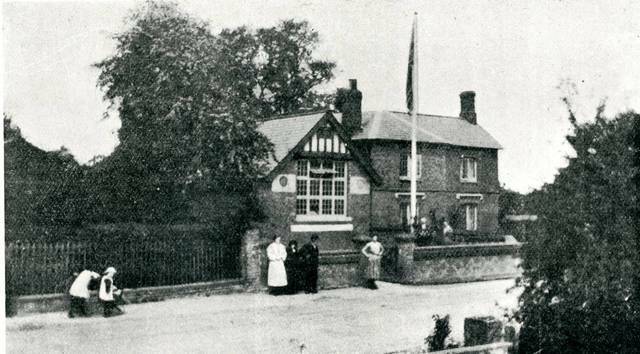 The Forge (which also acted as the local Vets) was built around 1780 and had been in the same family for generations. The Rowlands carried on the family business until around 1978. The family also run the village post office for a time from their home on the other side of The Green. Rose Cottage is a timber framed and weather boarded house which may have been built in the 17th century, partly with medieval material. The present owners won an award for modernising the premises around 1998. The Mason family purchased the cottage in1924 and it served the village as a General Store until the 1970s - before that time it was a sweet shop. The Cricket Ground and Club House was donated by Mrs Pemberton-Barnes for villagers to use and some very successful cricketers have been members of the cricket club. 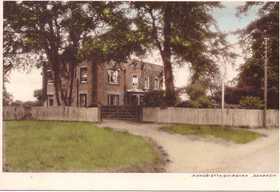 Fernside, Broxhill Road, is an early Victorian building which was the home of Harold Smith who published 'A History of the Parish of Havering-atte-Bower' in 1925 (descendant of Eric Smith). This publication is now sadly out of print, but it is recognised as one of the best authorities on the area. Bower Cottage, Orange Tree Hill dates from the early 19th century. Home Farm, Pyrgo Park, dates from late 18th century but was enlarged around 1867. Fairlight was reputedly constructed for Henry VIII's Farm Bailiff and to the rear of the house is the first grass tennis court constructed in this country. Fairlight Cottage is a small cottage that adjoins Fairlight and is thought to have been the 'pantry'. Many of the original features have been preserved to this day. On the outside of the house hangs a bell which was tolled to call the farm workers home and the owners salvaged the original 'iron lights'. Tiverton Cottage down the hill from the village school is one of the oldest houses in the district and was once a 'poor house'. The Village School was built and endowed by Dame Ann Tipping. An inscription on the wall records its original foundations in 1724 “For ye perpetual Education of Twenty poor children, Boys and Girls”. The school was rebuilt in 1818 and again in 1837 when Queen Victoria contributed £20 towards its cost. When the new building was started the pupils sat on the Green and ate a dinner of roast beef and plum pudding. In 1909 water was piped into the school so that the older schoolboys no longer took the water-cart to and from the village pump. A popular part of the school programme was the annual trip to Southend-on-Sea for which decorated wagons were lent by local farmers to carry the pupils to Romford station. Ivy Holt dates from the early 19th century. 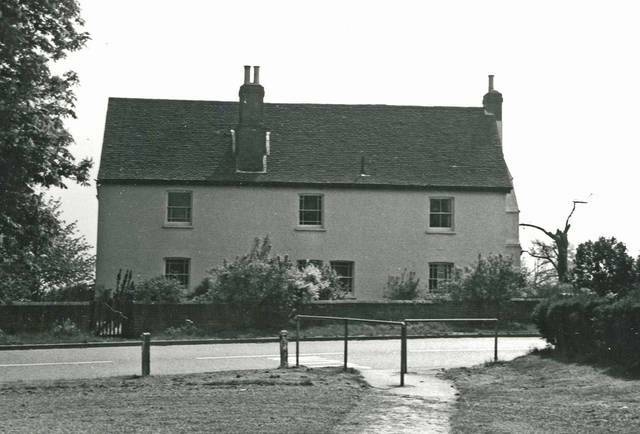 The original dwelling was home to Havering-atte-Bower's best-known eccentric, Elizabeth Balls who lived in the village in 1815 and shared her cottage near the Green with a large company of goats. Her menagerie included 14 goats, two sheep, 17 fowls, and a french dog. She also kept an excellent horse which she tended herself, and she would drive her horse and cart to Romford to collect hay for her goats. Photographs courtesy of Havering Libraries Local Studies, National Rose Society, Francis Firth, Freda Barnes.